The government is developing a new National Action Plan for Social Inclusion. The annual Social Inclusion Forum (SIF) will form a significant part of the consultation process for the NAPincl. In the run up to the SIF, GCCN is working with Community Work Ireland and EAPN Ireland to organise the first in a set of series of regional sessions in Galway on Monday May 8th in the Galway 2020 Hub at 11am – to be followed by the GCCN Social Inclusion, Community Development and Equality Linkage Group meeting. We would encourage as many GCCN members as possible to participate. The Social Inclusion Forum (SIF) is part of the structures put in place by the Government to support the development and implem entation of its plans to address poverty and social exclusion. The event provides a forum for wider public consultation and discussion on social inclusion issues, particularly with people experiencing poverty and social exclusion and the groups that work with them. In 2017, the theme of the SIF is Reflecting on the Past and Informing the Future and will be used to review the current NAPinclusion and support the development of the new National Action Plan for Social Inclusion as part of the commitment in the Programme for a Partnership Government. 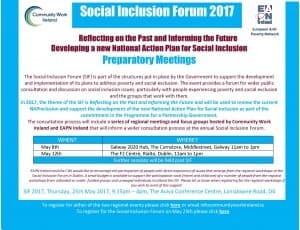 The consultation process will include a series of regional meetings and focus groups hosted by Community Work Ireland and EAPN Ireland that will inform a wider consultation process at the annual Social Inclusion Forum.